Lots of studios would agree that explaining our design services is sometimes the hardest part of our job as designers. Earlier this year, we redesigned our website. In the process, we realised how tricky it can be to succinctly explain our services as a multi-disciplinary design studio that works across branding, wayfinding and environmental graphic design. It’s easy to reel off a list of services. All design studios – including ours – do so on their websites. But writing down a list of design services doesn’t begin to convey our passion for design. It doesn’t express the fact that we truly care. Not just about design outcomes, but our client’s results and what they’re trying to achieve. That’s really first and foremost. So, we thought we’d single out a project that epitomises our commitment to rigorous design processes. 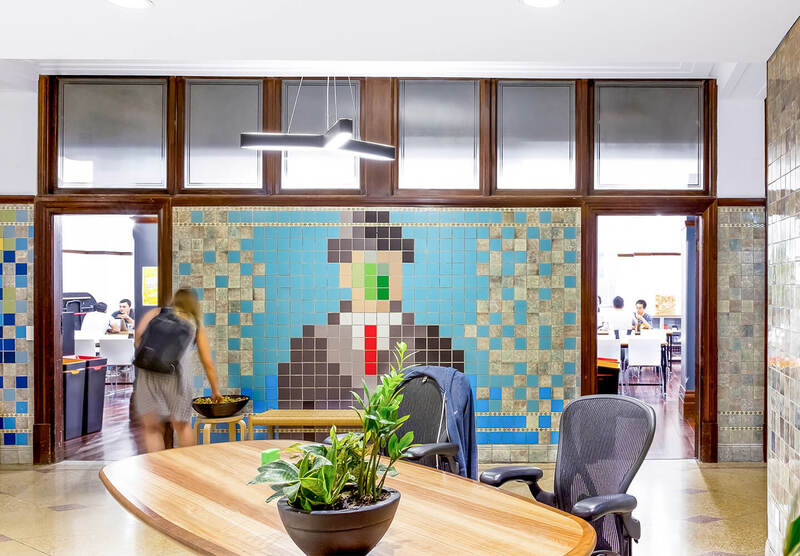 This project for Atlassian still lives vividly in our collective memory thanks to the love and care that went into its execution. Atlassian came to us with an unusual brief. They asked BrandCulture to design temporary environmental graphics for their Sydney headquarters to pay tribute to their 50,000+ customers. The project required lots of problem-solving to meet the demands of a tricky environment. It was vital our designs wouldn’t damage the building’s heritage tiles. 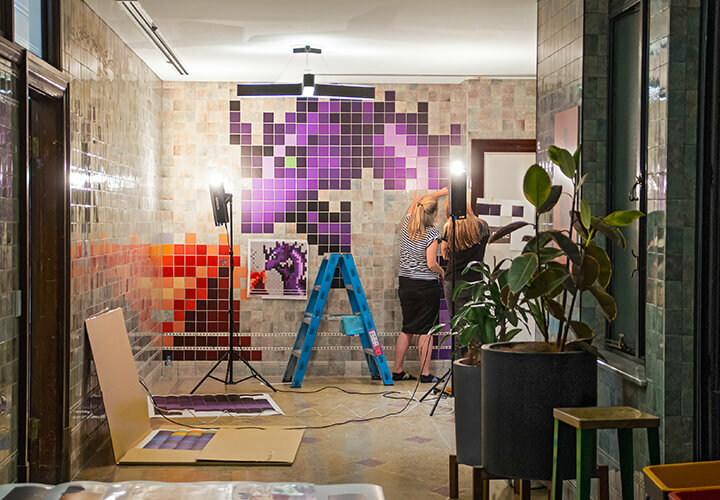 So, we designed pixelated wall murals using an ingenious paper that uses static suction to stay in place. At BrandCulture, we’ll go to the ends of the earth to make things happen – no matter what. We decided to install the mural ourselves, reducing the costs of a complex installation for the client. 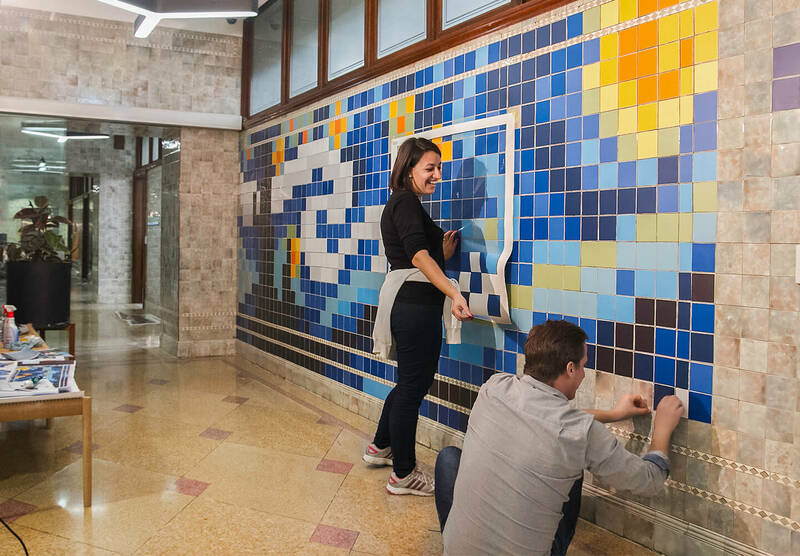 To ensure 5,000+ coloured squares would exactly fit each tile, every tile was painstakingly measured. 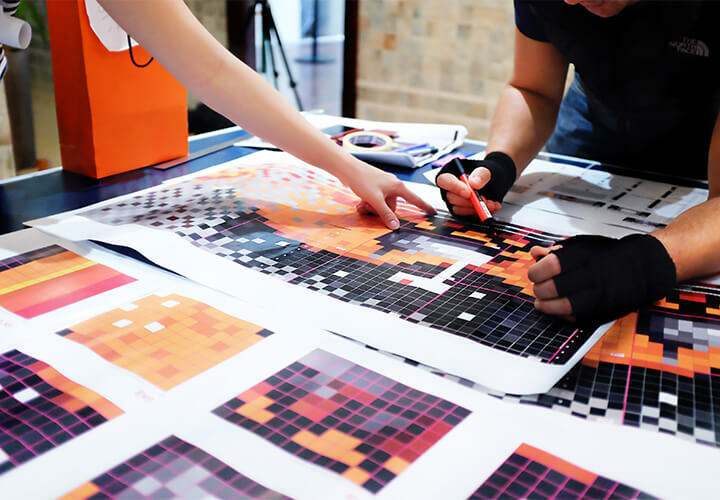 And every pixel was individually trimmed and adhered by hand. On Friday (prior to the Saturday install) the printers called. They had ordered the wrong stock! With zero time on our hands, we hit the phones. We found another firm who were prepared to work all night to deliver our pixels the next morning. Then we rolled up our sleeves and worked together, supporting each other as a team – which is how we get the best outcomes. This project utilised multiple skills from our list of graphic design services: brand engagement, placemaking, environmental graphic design, prototyping, project and production management. It also utilised all three of our key areas of expertise: Strategy, Design and Activation. More importantly, it reflects our core values. We are committed to combining quality design with premium levels of service. We’ll move mountains to meet every deadline. We’re determined to achieve great results for our clients and we collaborate and support each other along the way. At the end of the day, our clients mean so much to us. We value and respect them by offering premium services, which we are so very proud of. We believe it’s this (not a long list of design services) that sets us apart from other studios.